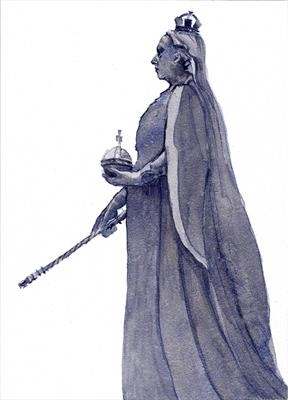 From my new series Windsor on my Walls: A small watercolour of Queen Victoria's Golden Jubilee statue that stands at the foot of Castle Hill in Windsor. The sculptor was Joseph Edgar Boehm RA. 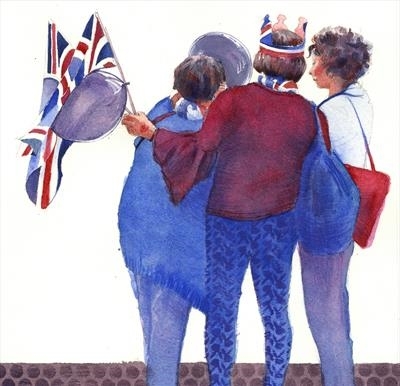 From my new series Windsor on My Walls: On the day of the Royal Wedding in May 2018 my town turned red, white and blue. 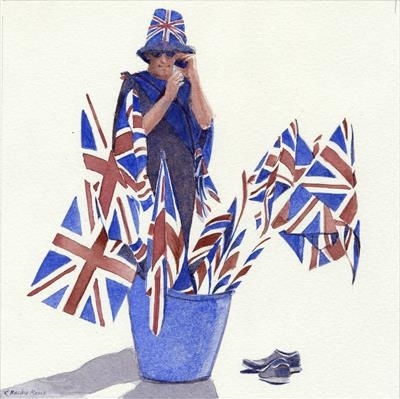 This series of watercolours is dedicated to the infectious joy of celebration we were caught up in on the day. Presented with an acid-free white mount in a white readymade frame that can stand on a table or hang on a wall. 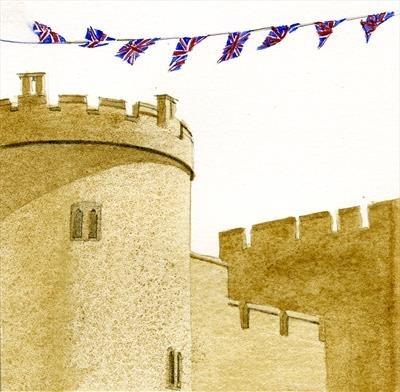 From my new series Windsor on My Walls: Festooned with flags and bunting, Windsor was a picture the day of the Royal Wedding in May 2018. One hundred thousand visitors flowed in and out of my town wearing red, white and blue and radiating goodwill. 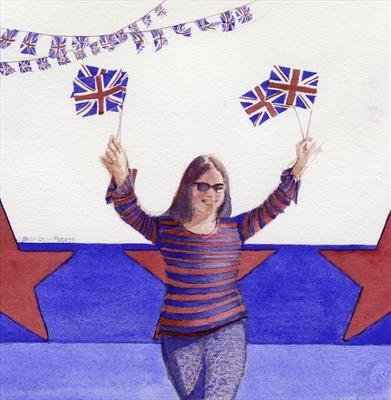 This series of watercolours is dedicated to the joy of celebration. Presented with an acid-free white mount in a white readymade frame that can stand on a table or hang on a wall. From my new series Windsor on My Walls: The world came to Windsor on the day of Royal Wedding in May 2018. Union flags and bunting were everywhere, and the celebratory atmosphere was irresistible. 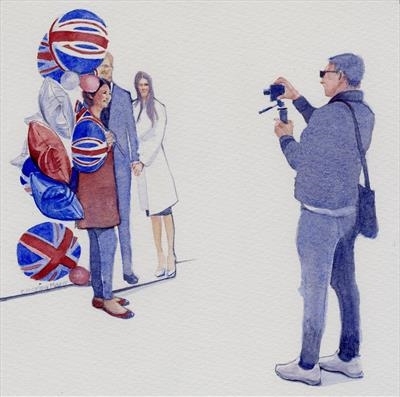 One hundred thousand visitors streamed into our town waving flags and wearing crowns, and wherever they found life sized cut-outs of Harry and Meghan they stopped to pose for photos. From my new series Windsor on My Walls: This is a minimalist view of the Queen Victoria pub round the corner from my house on the day of the Royal Wedding in May 2018. Visitors streamed down Peascod Street and St Leonard's Road on their way to the Long Walk behind Windsor Castle. The festive atmosphere and colourful props were irresistible. I liked the large paper crown in the foreground, and the tiny crown on the pub sign in the background. 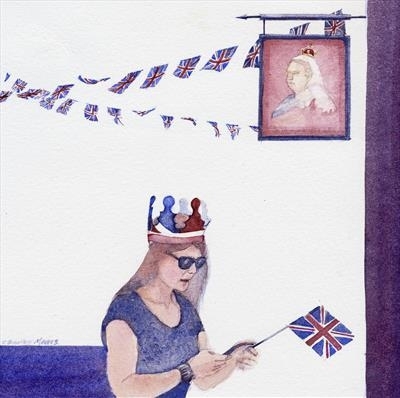 From my new series Windsor on My Walls: Celebrating the Royal Wedding in May 2018. Presented in an acid-free white mount and a readymade matte white frame that can stand on a table or hang on a wall. From my new series Windsor on My Walls: A bit of Windsor Castle on the day of the Royal Wedding in May 2018.